We make memory bears from wedding dresses. What better way to preserve Mom’s wedding dress and share it with siblings than for everyone to have a custom teddy bear made from it? Or what better way to use the remnants of a wedding dress? We try to use the significant materials from the dress in each teddy bear. We can make the wedding dress bear only, or we can make outfits from the dress for the bears as well. We limit the size of our wedding dress bears to a maximum of 16″ because most of the fabrics in a wedding dress don’t do well in larger teddy bear sizes. 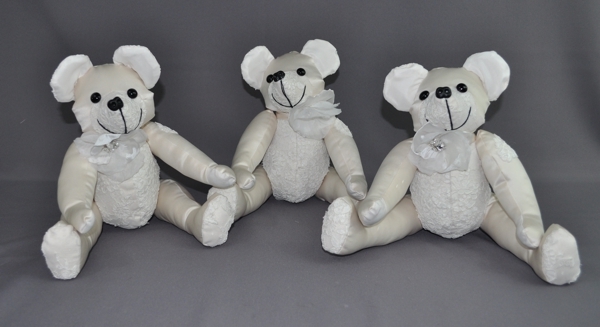 Each bear has jointed arms and legs, acrylic safety-lock eyes, plastic nose and comes with a ribbon or big bow. $18 Photo Badge Send us a photo of your loved one wearing the garment–or just a favorite picture–and we’ll make a badge that can be pinned to your bear. You can email a digital photo or put a photo in with your order. Download the PDF order form. Fill it out and send it, along with your garment and payment, to: Fairy Godmother Creations 1001 E Second St #3140 Dayton Ohio 45402 If you you have additional questions or just want to talk to a human being before making your decision, you can contact me at.